Maybe there are times you just can’t stop eating so much food, or maybe you just eat too much on a regular basis. You want to change, but you can’t help but wonder whether you will be able to survive without the food. Anyone who’s ever been faced with an addiction feels they can’t get by without their fix. It’s a lie (Click to Tweet) but a powerful lie that can keep your binge eating disorder going for years. As a smoker, I used to think that cigarettes had the power to wake me up, help me go to sleep, digest faster, relax me, and make me feel self-confident in all situations. I refused to see how much it affected my health, even if I was becoming borderline asthmatic and three of my teeth had gone bad in 18 months. The reason behind it was the fear that I couldn’t cope without cigarettes. How would I relax? How would I wake up and feel comfortable in any social situation without smoking? I wasn’t sure. I’d rather keep killing myself slowly than face my inadequacies. I was afraid I just couldn’t make it without the extra help. In other words, at some point I had disqualified myself as a woman capable of taking care of herself without drugs. The decision to stop smoking was not something I made at a conscious level. I don’t know when or how it happened. I just figured it out by observing my behavior. When I first started writing my workbook, 12 Minute Binge Eating Busters, I started talking about it to friends. I was surprised to hear how some of them reacted: “I’m afraid I’ll feel deprived,” or as some clients told me: “I’m not sure I’m ready to change.” These reactions are just different ways of expressing the same problem: fear of change. They experience fear: a fear of change, a fear of not having the strength, a fear of missing something, or a fear of doing without. I call the sum of these fears, resistance to change. Maybe you’ve sensed this internal conflict each time you’ve tried to let go of your binge eating habit. Maybe you feel you could actually change and that sounds exciting, yet at the same time it feels scary and threatening. A part of you may think, “Yes, I want to change,” while another part may be thinking, “Am I going to survive without the food?” This is a normal reaction. After all, for years you have been reinforcing the belief that food is your fix, your reward, your savior, your secret best friend, your refuge, and one of your best (if not only) sources of satisfaction or pleasure. It’s quite normal not to feel ready to let go of all this. Maybe you’re wondering who you will be without your addiction, what your life will be like, and whether it will be any better, or even if you’ll have to deal with the jealousy or negative reactions of others. You instinctively know that modifying the status quo involves some form of risk or loss. Since you’ve asked nicely, let me tell you this: The tools I give you have been tested over and over with great results. I use these methods on myself for pretty much everything. I have received incredible feedback about them. But whether or not you decide to use my method is irrelevant here. The truth is that whenever you want to change a habit , you will be faced with some form of fear. The first step to recovery is to accept that it’s perfectly OK to be afraid. 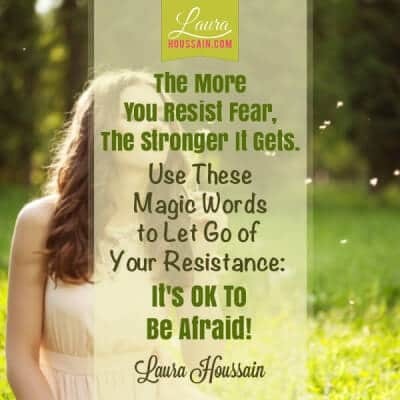 The more you resist the fear, the stronger it gets. If you try really hard to get rid of it, it will only get stronger. So the first thing you need to do is practice observing it with curiosity as if it were not your own. This may sound crazy but it’s incredibly powerful. All you have to do is look at it, hear the thought behind it, and mentally place both in front of you. You can then decide whether this is what you want to think. By doing this, you’re bypassing your automatic reaction. You already know where your automatic reaction will lead you. This time, instead of acting out on your craving, observe and ask questions: “Is this what I want to feel?” “Is this what I want to think?” If not, ask yourself: “Can I let the thought and the feelings go?” “What is it that I really need?” I cannot get into the details of this technique. For now, just remember you can do great things by having the curiosity to investigate your internal processes and challenge your thoughts. Start doing that today and you will build a muscle that will make you resistant to fear itself. So the first step is to welcome the fear as if not your own. The second part of this step is to really accept that you’re afraid without judging yourself for it. I used to beat myself up for not feeling good. I was frustrated and I fell into the “I should” trap: “I should never be afraid.” “I should never feel shy.” “I should have known.” I had a list so long it felt like I could have joined New York with L.A. if I had written it down or turned someone completely deaf if he had heard all of the items on the list at once. So if you have “shoulds” like: “I should be able to stop overeating easily,” “ I shouldn’t be afraid,” let them go. In this situation the only “should” you want to express is: “I should be exactly where I’m at right right now. I feel fine with who I am now.” That doesn’t mean you don’t want to change or you won’t change. Just accept that resisting a situation keeps it alive whereas accepting it puts you on solid ground for growth. It may be counterintuitive, but fighting your food addiction with all your might is actually a way to keep it alive. The main reason for this is that that’s all you think about all day. Another thing that will greatly help you is to become your own number one cheerleader. Take on the habit of encouraging yourself and say things like: “You’re doing great.” “Keep at it.” “I’m proud of you.” I literally speak to myself this way. It makes resistance to change vanish into thin air. Talk like this especially when you’re discouraged, or feeling panicked. 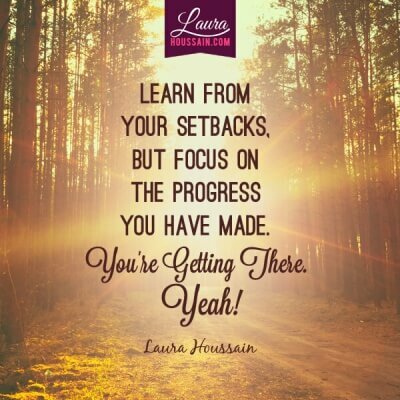 Focus on all the progress you have made. To really succeed, you must create a mental image or a mind movie of who you want to become, how you want to act, and how your life will be once you have changed. It’s better to do this two or three times a day when you’re relaxed. Try to step into your movie and live the life you will have once you’ve changed. Each time you doubt yourself, just follow all the above steps and mentally stare at the image you have created. Refuse to look at what you don’t want to see. It may sound oversimplistic, but it actually takes some practice. It’s OK if you don’t get it perfectly right the first few times. Just accept that you’re building a new foundation to your new you. You’re just learning how to stop eating so much, and that is a process. Encourage and congratulate yourself as often as possible. If you fail to do this, your fear will literally control your destiny; you will keep on sabotaging your efforts, you will feel bad about yourself, and you’ll lose your self-esteem and self-confidence. This is why I feel any method that doesn’t address the problem of fear is pretty much worthless. Many methods are good, but they ultimately fail because they don’t address this fear of change. Fear of change will always end up defeating willpower and cause you to sabotage your own efforts. If you really want to stop eating so much food for good, you need a method that will help you address your fear of change, your resistance to change, and the sabotaging patterns that have kept you eating all these years. My method addresses the fear of change before you start doing anything else, because if you don’t address this issue, you will fail. You will either give up or it will take you dozens of attempts with countless relapses that will leave you feeling drained and desperate. You don’t need this disappointment and stress. You must let go of all the deep-rooted fears and negative beliefs you attach around your goal if you want to stop eating so much. Congratulations for reading this far. Please apply these tips now and share your results in the comments below. I can’t wait to hear what you have to say. I love reading everything you have to say! 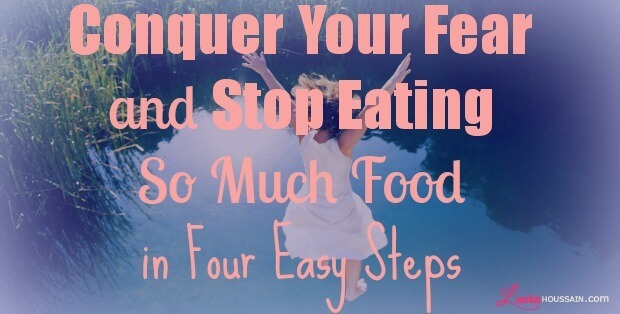 I agree wholeheartedly that I must conquer the root problems of my overeating to get rid of it for good. In a way no cleanse or diet restrictions can do. Thank you! I love lifting weights and taking walks. I love eating foods that are wholesome and delicious. Its the cravings in addition to the meal that trip me up. I’ve just created some action steps based on reading this article and I am hoping for the results I desire most. Every day is a mental struggle for me. Its never over especially when I think it is. I believe you P’Alex. Some of my clients eat well at meal time. But they can’t seem to understand why they have irresistible cravings. They key is to stop the struggle. To practice sitting still in the middle of the storm and cracking every craving open so that you extract the diamond there is in it. Hint: Every craving, can reveal to you everything about the way you think and feel and how that influences the way you relate to food. If you can withstand the discomfort, they can be real gifts.